I made this Cosmobella with some really fun paper picked up at my local supply store (LSS) a few weeks back! My favorite toy this week is my SU corner rounder with the guard removed. its quick, easy and makes some great scallops! Cosmobella is on whisper white card stock, stamped in basic black ink. 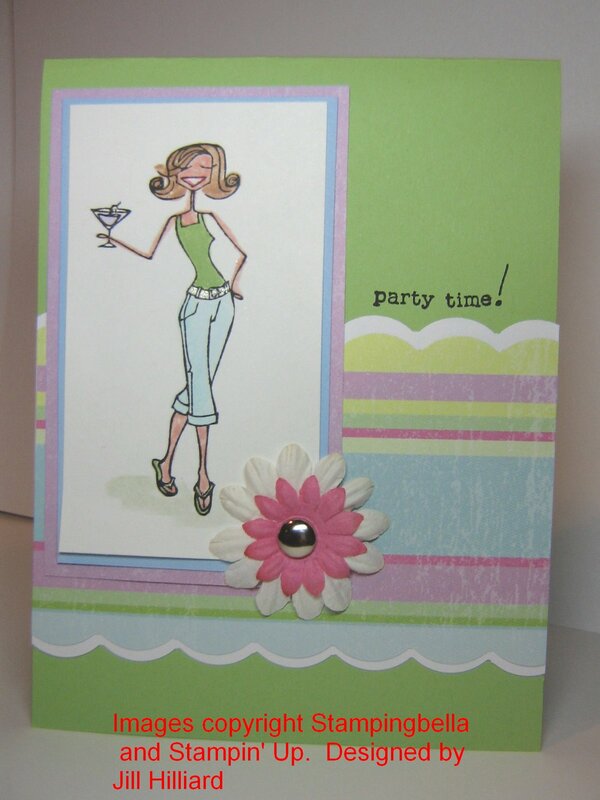 Her shirt & flip flops are colored to match the card stock in certainly celery. Her pants are colored a pale blue, using water color crayons and the water brush to match the designer paper from K & Co. Her skin is blush blossom marker– my favorite for all skin tones! She drinks a purple martini (also to match the paper). And what you can’t see (unless you click and super size the picture) is her silver belt- done with the SU double sided silver and gold painty pen. Sentiment is Everyday Flexible Phrases and the paper flowers are from CTMH. That’s a jumbo brad that I bought at Joann’s. Great Bella card. She is so much fun! Great Bella card!!! Love it!